Many families select an American history tour for their road trip with school-age children, and there’s nothing more fun than exploring the regions of Philadelphia, Lancaster and Gettysburg together. Summertime means family vacation and for kids, a much-deserved break from classroom learning for several months. A road trip across the U.S. is a great way to introduce your kids to a bit of American history, especially when you pair historical sites with kid-friendly activities. A Pennsylvania road trip, starting in historic Philadelphia, moving on to the Amish and Mennonite village of Lancaster, ending in the battlefields of Gettysburg, hits the right balance between learning and fun. 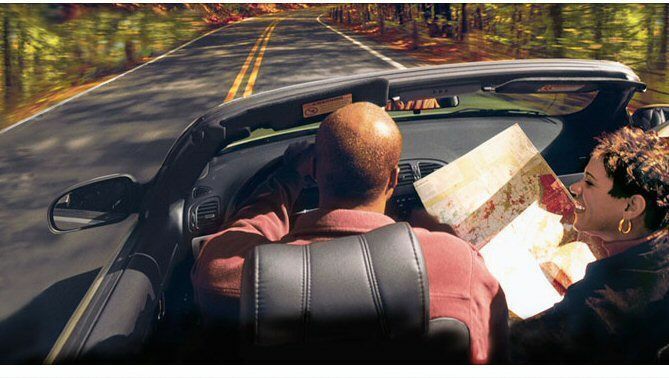 It’s also an ideal itinerary for families who are short on time or don’t want to spend too much time in the car, because you can pack in a lot of variety in just a few days. Philadelphia was founded in 1682, so there are many historic aspects to the city. Kick off your tour of the town in the Historic District, with a free visit to The Liberty Bell Center, located on Market Street, between 5th and 6th Streets. Try visiting the flag-maker Betsy Ross’s House, which is surprisingly compact. You can meet her impersonator and partake in hands-on exhibits for visitors of all ages. Thirteen one-of-a-kind free Storytelling Benches are scattered around the Historic District all summer long. Costumed storytellers will entertain and educate you while sharing secrets of Philadelphia’s place in America’s history. You will want to view The Lights of Liberty Show, a 12-minute film journey through history at the Historic Philadelphia Center. While telling an educational story, it will astound children and adults alike. It has been re-vamped into a 3D experience with animated imagery in a state-of-the-art theater. The National Constitution Center is an interactive museum located in the heart of the Historic District that families will find both fun and informative. It is the only museum devoted to the Constitution, and it manages to bring this document to life, showing its relevance to our current lives. It has some wonderful multi-media exhibits that are sure to please the entire family. Put on your scientific hats and head over to The Franklin Institute on 20th Street and Benjamin Franklin Parkway. This interactive museum is a winner with kids of all ages. You will not want to miss the Human Heart exhibit, where you can walk thru a giant heart-like structure and check-out clogged arteries. See how fit you are in the Sports exhibit, ride on the full-sized train that blows actual smoke, and bike across a high wire. The Franklin Institute has something for everyone. The littlest travelers will enjoy the Please Touch Museum. Considered one of the finest children’s museums in the country, it has recently relocated to a new home in Fairmount Park, which has only enhanced what was already a great museum. It is aimed at children aged 7 and under, but older children should be entertained at this interactive gem. Reading Terminal Market on 12th Street is a great place to stop for a bite when hunger strikes. This is one of the nation’s oldest covered markets, and you can find anything that you may be craving. The market offers cooking demonstrations in a state-of-the art kitchen, so you may get lucky and get to watch the preparation of a local delicacy. 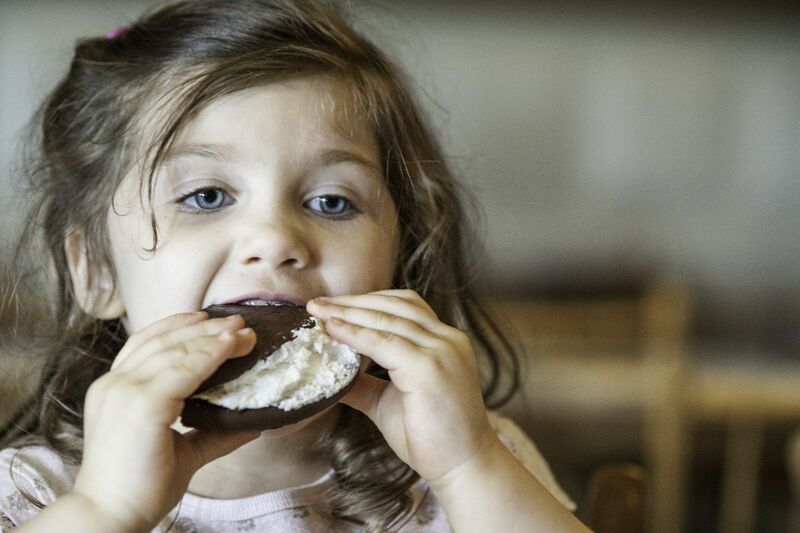 When your family feels like some outdoor fun, check out Franklin Square. This outdoor park is an amusement oasis, where families can ride the Liberty Carousel, play mini golf, romp in the playgrounds, and relax. Local restauranteur Steven Starr has a hamburger cafe in the square with a great reputation. Philadelphia has some great hotel choices for families. The new Kimpton Palomar is centrally located near many museums and historical sites, just off lovely Rittenhouse Square on 17th and Sansom Street. The Palomar caters to families, making kids feel welcome from the moment that they check-in, when they are greeted with a gift. Complimentary pretzels, drinks, and wine for the grown-ups are served in the lobby each afternoon. 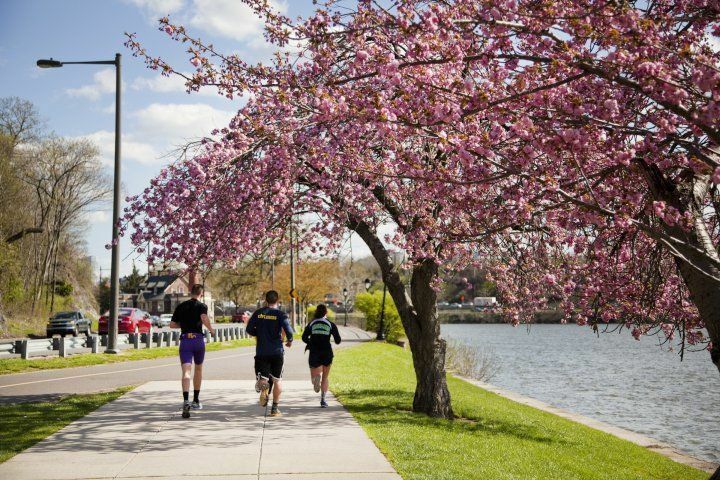 Best, it is within walking distance from most of Philadelphia’s historic sites. The city could keep you busy and entertained for weeks, but the lush farmlands of Lancaster County and the Pennsylvania Dutch Country await. Head out of Philadelphia on Interstate 76. You can stay on this road for nearly the entire 80-mile journey to Lancaster, but veering off onto smaller, less-traveled Route 30, allows you a more scenic view. You will pass by charming towns like Strasburg, giving you a peek into local life and in under two hours you will be in Lancaster. As you enter the county, you will feel instantly transported into another place and time. 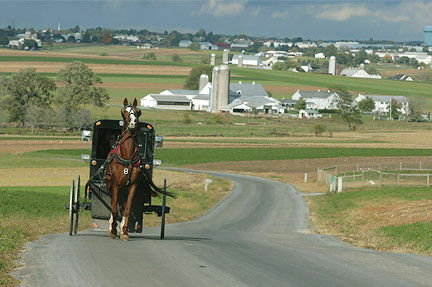 Amish farmers driving their horse-drawn carriages share the road with Fords and Chevy’s in this part of the world. Meticulously tended farms dot the countryside. The Amish people left Switzerland and Germany at the end of the 17th century due to religious persecution. Visitors will find farmers working the land as their forefathers did, without motorized equipment or modern conveniences. Driving through the rolling farmlands you will see corn and tobacco fields, classic barns and silos, and cows grazing on rolling hillsides. Roadside farm stands run on the honor system. A good place to begin your tour is The Mennonite Information Center (717/299-0954) located between Strasburg and Smokestown . 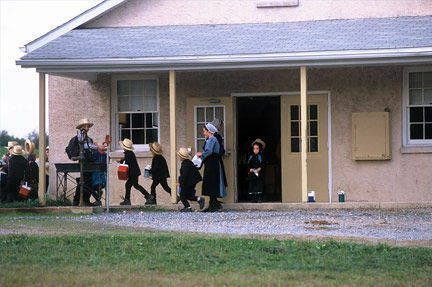 This educational center offers an overview of the life of the Amish both in the 30-minute, 3-screen movie “Who Are the Amish?” and in a walk-through exhibit about both the Amish and Mennonite people. You can arrange a same-day guided tour, in which a local MIC guide will ride with you, show you the area and authentic businesses, and answer all your questions. They can help you can locate listings of Mennonite-run tourist and working farm homes. Additionally, the Amish Farm and House on Route 30 offers tours that explain the Amish way of life. You can learn about their farming techniques on the grounds of this working farm. 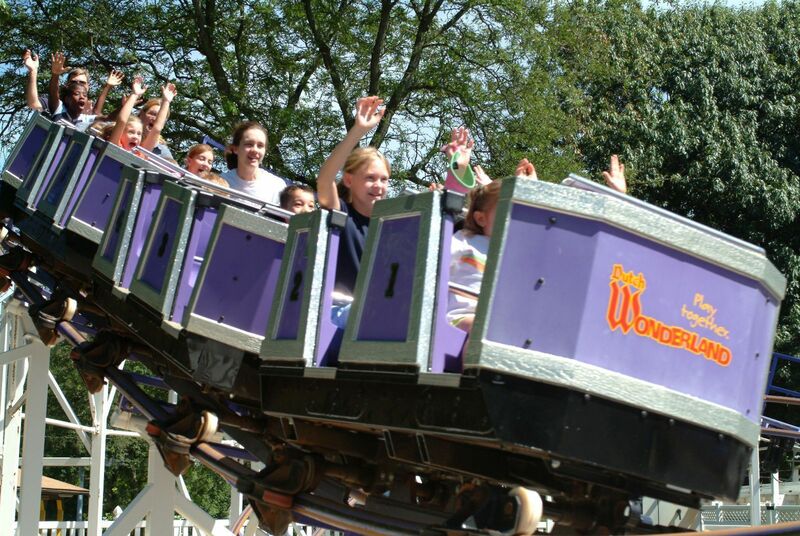 When your younger ones need some summer fun, Dutch Wonderland Family Amusement Park is sure to please. More than 30 rides are available, and a pay-one-price plan allows you to try them all. The area hosts several Farmers Markets. The Central Market in Lancaster is one of the oldest covered markets in the country, and sells some tasty local treats, perfect for picnics. The neighboring town of Strasburg is home to the Railroad Museum of Pennsylvania, a perfect stop for train lovers. If you are traveling with a Thomas the Tank Engine fan, check their site to see when Thomas will be in town. Pennsylvania Dutch Country is full of family-style hotels and motels. In Lancaster, Willow Valley Resort has 3 pools, an indoor water playground, and family activities. There is a good restaurant and bakery on premises. Other establishments are not lacking in this part of the world. Many offer unlimited portions of hearty local favorites, like shoofly pie and chicken and dumplings. Few places in America can rival Gettysburg in terms of importance in Civil War history. Its strategic location led to the town’s involvement in one of the bloodiest and most significant battles in the War Between the States. Leaving Lancaster, you will once again connect with Route 30 towards Gettysburg; the distance is a relatively short 55 miles. The main entrance to Gettysburg National Military Park is at the Visitor Center, so this is a good starting point for your tour of the battlefield. It is here that one of the Civil War’s deadliest battles was fought, where 51,000 lives were lost in July, 1863. The massive number of casualties, combined with the brevity of the battle, makes Gettysburg a must-see for anyone with even the slightest interest in Civil War History. President Lincoln delivered his famous Gettysburg Address here in November, 1863, when the devastating battle was still fresh in hearts and minds. The vast park covers 31 miles of marked avenues, and includes 1,300 monuments and markers and three observation towers. It has been preserved to allow visitors to try and understand the trials that the soldiers endured during this brief and all too bloody battle. Civil War buffs can and do spend weeks exploring the battlefields, some making annual pilgrimages to the site, but much can be understood about the Civil War from even a short visit. You can wander and discover the battlefields on your own, or book a private tour at the Visitors Center. Gettysburg is commemorating the 150th anniversary of the Civil War with a slew of special events, starting in 2011 and continuing until 2015. For information on these events and for more information on visiting Gettysburg check out www.gettysburgcivilwar150.com. When the kids get tired of walking, take a ride on the Gettysburg Scenic Railway. 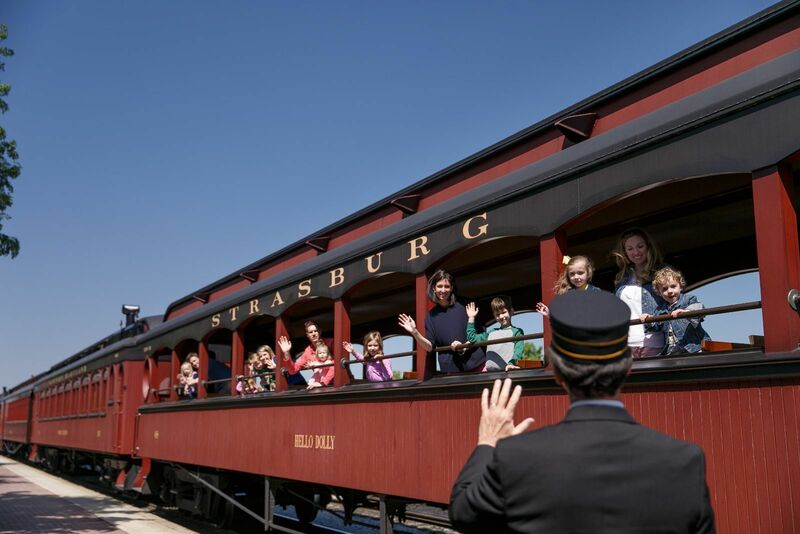 Train buffs will also enjoy a stop at the Lincoln Train Museum, where you can view 1,000 toy trains and take a simulated trip aboard the train that took President Lincoln to Gettysburg. The area has no lack of motels, hotels and campsites that cater to families and family-friendly restaurants abound. 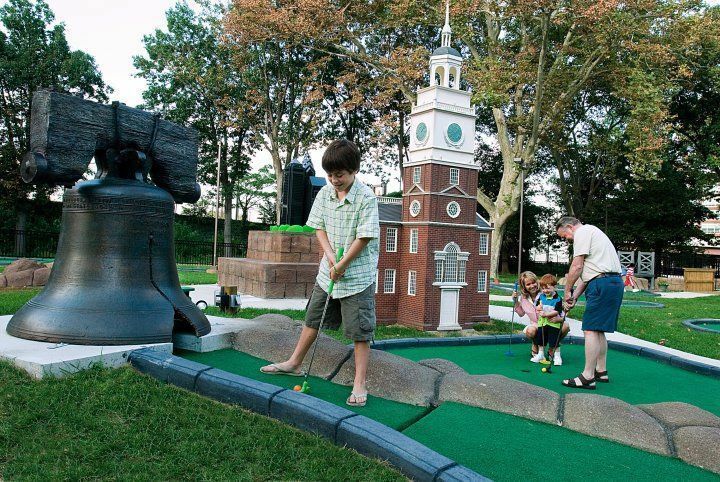 There are several miniature golf courses in town, so it is not purely military history and battlefields. A good time can be had by families who are not particularly drawn to historical sites of this sort and you’ll be delighted how much fun gaining knowledge of this important period of American history can be.